Facebook is great when it keeps you connected to the people in your life. But when it becomes such a pervasive part of your existence that you’re perpetually comparing your life to everyone else’s and wondering, with tears streaming down your cheeks, why yours isn’t as fabulous? Not so much. Not everyone is brave enough to just go cold turkey on their Facebook habit, which is why these 10 Pinays who quit the social network for good could teach us a thing or two about sticking with what’s real over the social media highlight reel. Read on and prepare to feel a twinge of envy at these courageous souls, while at the same time cursing the two hours you’ve already spent mindlessly scrolling through Facebook today. “Scroll up and down, up and down, up and down. This was how busy my fingers were whenever I would log into my Facebook account. Morning unril evening, from when I first opened my eyes to the time I shut them to sleep, I never missed checking my Facebook account. The first few days off Facebook were very hard, but deactivating eventually made me manage my time better and helped translate those online activities into real-life experiences. I spend time chatting with real people and friends I 100 percent know now. I hit real-life like buttons by giving affirmations to the people I encounter. I update my whereabouts by asking friends to join me for a coffee date or a KTV session. “I deactivated my Facebook account when I was going through a lot of tumultuous changes. People who were my closest friends proved disingenuous IRL, picture-perfect parties/trips/vacations masked a lot of shade-throwing, and while my feed and my outside appearance were more Zen than ever before, I felt I was at my most inauthentic. I left my job, ended relationships, broke ties, and deactivated my Facebook account without any second-guessing. It was tough to let go of a way of life that looked so chill and good on the outside, but it was one of the most gratifying decisions I’ve ever made. “I became a Christian in 2013, and from then on, I started serving God and seeking His will. But after my boyfriend broke up with me, I realized I had made him the most important person in my life—instead of Jesus. Part of getting back to the basics of my faith was turning away from things that could lead my heart astray again. So I cut off the things that would otherwise tempt me to dwell on the past—including Facebook, where I could likely stalk my ex or be tempted to communicate with him instead of letting God take control of the situation. “A lot of my Facebook friends are smart, but not so empathetic. My annoyance started to build towards people who think too highly of themselves. It seemed that most people shared their thoughts to fight or intimidate, and not to share wisdom. I also found it odd that people I’m not close to could just look in on my life. You know when a random person likes or comments on a photo from three years back? Yup. Creepy. What really weirded me out was when I found out a co-worker actually saves my pictures on his phone. I hated this kind of invasion of my privacy. “Sometime last year, I deactivated my Facebook and Messenger accounts. I guess a heartbreak was the last straw for me to quit. But even before this happened, I was already questioning my capabilities. I started comparing my life to the lives of my Facebook friends. I’ve had health issues because of stress and I felt that my efforts at work were not paying off. I felt like a failure in every sense of the word. Deactivating helped me move on: both from the heartbreak and the unhealthy mindset. Social media is one of the causes of depression since we have this tendency to compare ourselves to others. We’re too impatient, too harsh on ourselves, that we forget our own timeline. 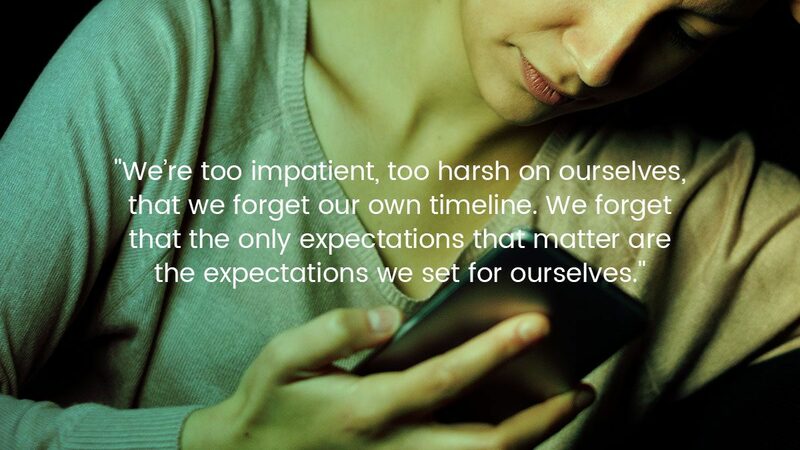 We forget that the only expectations that matter are the expectations we set for ourselves. “In the past year, I felt that people on Facebook had lives that seemed too good to be true. I started to wonder if my life was bad because the things happening in their lives were just amazing in comparison. And sometimes, I even imbibe the negativity of some acquaintances. During the last Lenten season, I told myself to detoxify from social media. I deactivated my Facebook and tried to look into what my life was lacking—why was it that I wanted the life that I did not currently have? I knew it was wrong, and I was adamant to change it. Since I got off Facebook, I’ve slept longer, I’ve become thankful for the simple things, but most of all, I’ve become thankful for the life given to me. And I got to rid myself of acquaintances from long ago who reek of negativity. “I had a couple of failed attempts prior to fully deactivating my Facebook account. First was when my ultimate crush whom I believed reciprocated my feelings—he made me believe he did, swear!—posted about his girlfriend. He actually had a girlfriend, WTF? But I went back to the grid after feeling the need to be updated again. One day, I just woke up feeling frustrated at people thinking I’m super successful and expecting so much from me because I didn’t feel the same way about myself; I knew I wasn’t successful yet, based on what I saw in my news feed that painted another picture of success in my mind. Plus, I had a clash with my Facebook-active sister-in-law, so I decided to get off Facebook for real. “While Facebook is not inherently toxic, it is designed to consume people’s limited attention and reduce the cost of their social interaction. Clearly, being simply on it reduces their time for doing something more valuable offline, and worse, it discourages them from cultivating social relationships in-person—a proven way to create spaces for deeper and more meaningful connections. With this in mind, I know that there is really no strong case for why it is beneficial for me to take my time and attention away from the work I love, the family and friends I enjoy spending time with, and the things I actually enjoy doing like reading, gardening, or learning new skills. “Two things prompted me to deactivate my Facebook account: a persistent stalker and opportunistic people. The latter dealt the final blow. I am an OFW and it can be funny and frustrating sometimes how ‘rich’ people think we are. Once and for all, we don’t get buckets of money; whatever we have now took us blood, sweat, and tears to achieve. At first I didn’t mind a few friends, relatives, a neighbor, a batchmate, and sometimes even the are-you-sure-we-have-met-before types sending me a message to ask if I could lend them some money or donate something to their organization. At some point I would say yes and would find myself giving in. But then I realized it was getting worse to the point that I had to prove to these Facebook contacts why I couldn’t lend them money. I’d feel a pinch of guilt whenever I refused, when in fact, I shouldn’t. “I quit Facebook because I don’t want my world to revolve around it. These days, people rely on Facebook to express themselves and live their lives, but what you see on Facebook is just a fantasy. You become jealous of other people; you become challenged by what they have or are experiencing and you think you should have and experience the same. It doesn’t become healthy when you begin to form your wants and needs based on what you see others post on Facebook. Social media is fine if you know how to balance your use of it, but if it becomes an endless cause for competition or conflict, it’s not worth it anymore.